Guigal is rightly acclaimed for its flagship wines, among them notably La Landonne, La Mouline, La Turque and Chateau d’Ampuis from the Northern Rhone appellation of Cote Rotie. In this company it is easy to forget that the firm also produces fine wines from all corners of the Rhone Valley, including generic Cotes du Rhone. Etienne Guigal, founder of the firm, first worked for Vidal-Fleury before establishing his own business in 1946; Vidal-Fleury is now owned by Guigal, having been purchased in the mid 1980’s. The gorgeous Chateau d’Ampuis now headquarters of the Guigal business was acquired in 1995 and extensively restored. Other acquisitions have followed. The foresight, energy and passion of the Guigal family is obvious in everything they do. For example, not content with the brilliance of La Mouline, first produced by Marcel Guigal (Etienne’s son) in 1966, Marcel, recognizing the quality and possibilities of the vineyards comprising La Landonne went to great lengths to secure them. Quoting from Livingstone-Learmonth & Masters’ The Wines of the Rhone Valley, Marcel says “You can’t imagine the trouble we went to in order to buy up the La Landonne vineyard. It belonged to seventeen small holders, and I am sure I shall never have to be so patient again when it comes to buying a vineyard. It took more than ten years, buying each plot individually…” La Landonne was launched with the 1978 vintage. Back to the purpose of this piece: I was having lunch a couple of months ago at Bergerac, a French restaurant in Melbourne’s central business district, and was asked to select the wine by my host. My choice was E. Guigal Cotes du Rhone (rouge) 2011. My host, to my surprise (he eats at all the best restaurants) had never heard of Cotes du Rhone. Well before the first glass was finished, he asked where he could lay his hands on some, and after lunch went off to buy a dozen, encouraged by the wine and its astonishing price to quality equation. I agreed with his decision. The wine is immediately expressive of the Cotes du Rhone terroir, a medium bodied complex of briary, dark berry fruits, with herb, spice and tobacco notes and it simply outperforms its price – around $A20 retail. Unlike most wines from this appellation, it always contains a high proportion of Shiraz and in this vintage the proportion is 60%, with 35% Grenache and 5% Mourvedre. Guigal’s Cotes du Rhone is always given the opportunity to settle and integrate so that it is ready to drink on release, a blessing in a market full of wines at the same price that are aggressively youthful and from more recent vintages. Some vintages of Guigal Cotes du Rhone have given enormous pleasure after ten years under the staircase; the 2011 is terrific for drinking now and over the next several years. Guigal Cotes du Rhone has been available in Australia since around the 1978 vintage and was first introduced here (I think) by Farmer Brothers the Canberra importer. It is now imported and distributed by Negociants Australia. The 2011 is about to be replaced by the 2012 vintage early in 2016. In 2012 the composition is 50% Shiraz, 45% Grenache and 5% Mourvedre. According to winemaker Philippe Guigal the firm would have produced a Cotes du Rhone from the first vintage in 1946, but is not sure. The Cotes du Rhone appellation was established in 1937. Today Guigal produces 3.5 million bottles of its Cotes du Rhone rouge each vintage. All of the wine is purchased in a colossal exercise from around 250 suppliers, some of whom have been supplying the firm since its establishment and with whom Etienne Guigal worked since the 1930’s when at Vidal-Fleury. Marcel and Philippe Guigal taste and re-taste hundreds of samples to assemble the wine. They pay a premium to their suppliers; in vintages such as 2008 there is none produced but the suppliers remain loyal. By reputation, Guigal pays the highest price for generic Cotes du Rhone, but only for commensurate quality. The wine is assembled and held at the Guigal cellars in the village of Ampuis where three to four vintages of Cotes du Rhone rouge (let alone the white and the rose) are held (old 500L oak foudres are used) before bottling after 12-18 months. 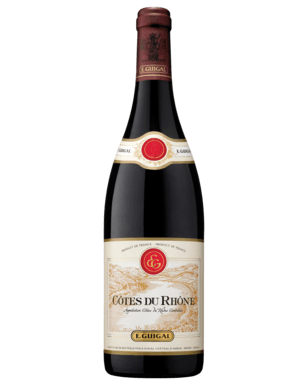 To close, the Cotes du Rhone is sealed with very high quality cork and this for the basic wine of the Rhone Valley. Philippe Guigal, with a touch of whimsy explains in the linked video https://www.youtube.com/watch?v=KceVmNTqdrA, that he finds it much easier to dream of the perfect cork than a screw cap. No chance of a screw cap for any wine from Guigal, and thank goodness for that.